Beyond safety and air quality, the transportation system plays a larger role in personal health than most people might think. Pedaling a bicycle and walking (I.e., "active transportation") are physical activities that burn calories and keep hearts strong and healthy. Research shows that active transportation lowers the rate of chronic illness; disease that could be prevented through improved nutrition and physical activity. Locally, 63 percent of Monroe County's adult population is obese or overweight and 35 percent of adults have high blood pressure. What if planners found a way to advance transportation projects while at the same time addressing these health statistics? Strategic investments in bicycle and pedestrian networks encourage people to opt to travel by foot or pedal power. As defined by the National Research Council, a Health Impact Assessment (HIA) is "a structured process that uses scientific data, professional expertise, and stakeholder input to identify and evaluate public health consequences of proposals and suggests actions that could be taken to minimize adverse health impacts and optimize beneficial ones." GTC partnered with Common Ground Health to conduct the HIA process - studying the connection between transportation and local, current health trends - uncharted territory for both organizations. A Steering Committee was formed to guide the project. It consisted of representatives from the Monroe and Livingston County planning offices, the City of Rochester, Parks and Trails New York, the University of Rochester, Genesee Valley Greenway State Park, and Conkey Cruisers, a local, urban, community group focused on promoting bicycling and led by a health advocate. The assessment itself was researched, developed and written by staff at Common Ground Health and reviewed by GTC staff. The project team chose to conduct the formal assessment on two existing elements: the Rochester Bike Share Program and a large portion of the Genesee Valley Greenway, a mostly rural, multi-use trail. The studies look at factors that affect public health - factors often referred to as the social determinants of health including physical activity, economic benefit and equity, and social cohesion - and provide a collaborative path forward for future investment and development of the trail system and enhancements to the bike share program. What barriers exist that discourage people from using the trail or other bicycle/pedestrian infrastructure? Is it the trail or roadway surface? Parking? Awareness? Safety? What potential does a multi-use trail or a bike share program have in motivating people to improve their physical and mental health? Accessing fresh food? What other benefits can transportation decisions have on public health? Opportunities to positively impact current public health issues through transportation investments surely exist, but not if the right questions don’t get asked! GTC is on the leading edge of MPOs in conducting HIAs. It has only been within the last few years that HIAs have been utilized to more prominantly consider the potential benefits to public health in transportation planning. This project, “Advancing Health Informed Transportation Decisions” (UPWP Task 5241) was jointly funded with federal planning funds made available through GTC’s Unified Planning Work Program and with contributions from Common Ground Health. GTC and Common Ground Health entered into a Memorandum of Understanding to conduct this project. GTC programmed Federal Highway Administration (FHWA) Metropolitan Planning funds (PL) to provide two-thirds of the budget. Common Ground Health provided staff to conduct two HIAs and the remaining one-third of the budget. The study looked at four factors that affect public health, factors often referred to as the social determinants of health. Physical activity: Approximately 63 percent of Monroe County's adult population is obese or overweight. Providing opportunities in urban areas for increased active transportation encourages physical activity. Economic benefit and equity: Active transportation and cycling in particular can reduce personal transportation costs. According to the American Automobile Association, the average cost of owning a car was $8,469 a year in 2017. By contrast, most bike share programs cost $50 to $100 annually. Social cohesion: Communities with greater levels of participation in community activities have better health outcomes than those with less engagement. Bike share has proven to be one of the most effective ways to introduce new riders to cycling, fostering further interest in active transportation. Access to food: Poor access to supermarkets has been linked to increased health disparities, such as diabetes, heart disease and obesity. 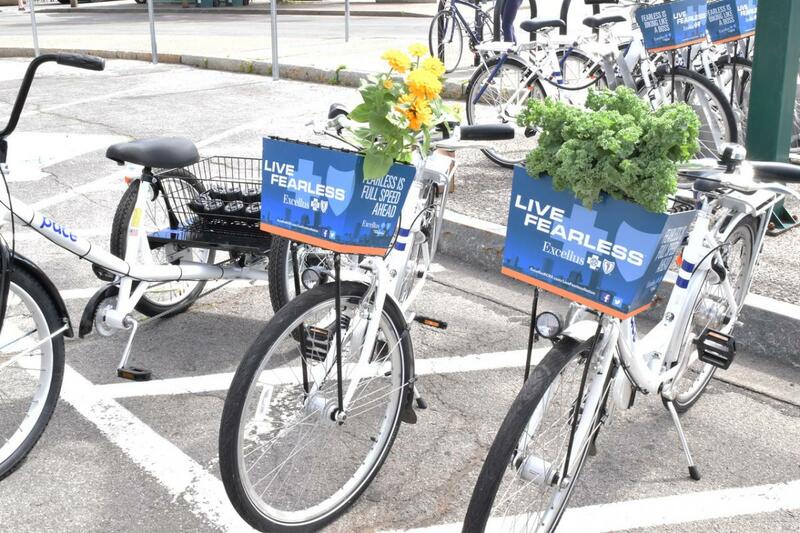 Bike shares offer a new way to travel to grocery stores, farm markets and other fruit and vegetable retailers. Continuing to improve infrastructure such as bike lanes and sidewalks. Prioritize neighborhoods with poorer health when siting new bike share stations. Physical activity: Approximately 63 percent of Monroe County's adult population is obese or overweight. Providing opportunities along the trail for increased active participation encourages physical activity, which help residents maintain a healthy weight. Access and infrastructure: Studies have shown that people with higher incomes are more likely to use walking trails than those with lower incomes. Roughly 15 percent of Monroe County residents and 13 percent of Livingston County residents fall below the federal poverty level. Raising awareness and accommodating the needs of all potential users increases use. Safety: Personal safety concerns impact physical activity the most in women, African Americans, Latinos and people over 65. Reducing risk of injury and providing adequate way-finding signage and lighting helps allay those concerns. Social cohesion: Communities with greater levels of participation in community activities have better health outcomes than those with less engagement. Organizing hikes and other trail events bring people together and foster further interest in physical activity. View the full Health Impact Assessment of the Rochester Bike Share. View the full Health Impact Assessment of the Genesee Valley Greenway. Read the press release and view photos from the press event held on July 30, 2018, in Scottsville, Monroe County. Learn more about Genesee Valley Greenway State Park. View a map to plan a hike or bike ride. Learn about planned guided bicycle rides and guided hikes and other projects and programming offered by the Friends of the Genesee Valley Greenway. The Pew Charitable Trusts is a major champion of the HIA methodology and is a respected, not-for-profit organization that provides facts and science for use in public policy. Pew, which works in partnership to oversee the Health Impact Project, hosts a clearinghouse of more than 400 individual HIAs conducted by government agencies, educational institutions, not-for-profit organizations, and/or collaborations in the United States. As of July 2018, seventy-five were in the transportation sector. Of those, about a dozen assessed health impacts of bicycle and/or pedestrian projects. Fewer than 10 were conducted by MPOs. Kansas University School of Preventive Medicine and Public Health is the only other entity that completed an assessment of a bike share program (Topeka, Kansas in 2015). View the Rochester Bike Share listing. For more information about this topic, please contact Program Manager Jody Binnix at 585-232-6240 or jbinnix@gtcmpo.org.